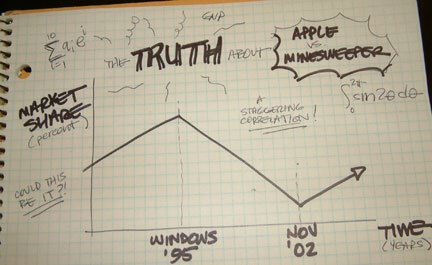 The truth about Apple and Minesweeper. As a purveyor of minesweeper-like software, I felt it my duty to investigate its roots, to gain a deeper understanding of the game that so nourishes my soul. My journey took me far and wide, hither and yon, IHOP and Sizzler. I met with gamers, economists, developers, and a variety of people who needed to burn time at work. As I sythesized all of the knowledge gained on this pilgrimage, one thing became clear: Minesweeper, not Microsoft, is Apple's arch-nemesis. A nameless acquaintance of Bill Gates (author of the original minesweeper) pulled me aside at a Seattle-area Denny's and removed some cryptic notes from his satchel. "After years of trying, Bill knew he could never beat Apple at the OS game, so he had to find another front to attack on." Peering over his research, it dawned on me that Minesweeper, a simple game of mouse and mind, was key to Gates' diabolical plot. "Apple never gave people the tools to do what they so desperately desired - waste time at work. People are far too productive on Apple hardware! Once Bill bundled Minesweeper *with* the productivity apps... well... productivity returned to normal levels, and Microsoft established a technology lock-in that couldn't be broken." The evidence was irrefutable: with the introduction of Minesweeper in 1995, Apple began a precipitous drop in market share that seemed unrelenting. With this new knowledge came pain. Could my progeny, BombSquad, be the spawn of the very demon that caused my beloved Apple its relentless slide? Perhaps I was playing a role? Perhaps my work was detrimental in some way? Despite all the intricate emotional barriers I had in place, this was too much to bear, and I broke down over my Grand Slam breakfast platter. "John," said my nameless accomplice, "that's not the end of the story! Look to the end of the graph!" Indeed, I could see through the tears that Apple has been faring quite well as of late. "Well, with all of the switchers, and the iPod halo effect, and all those nasty viruses and stuff, I would think Apple's market share would pick up - it just makes sense," I ventured. "No, John, NO," opined my companion, recalling Christopher Lloyd to my Marty McFly, "don't you see?! The iPod predates November 2002, as do Windows viruses and Apple marketing campaigns! What did Apple get in November 2002 that it sorely lacked before? What finally allowed this valiant knight to compete with the dragon that is Microsoft? What..." Fortunately, his pie arrived, and with it, peace returned to our booth. In the contemplative solitude, it hit me like an anti-trust/monopoly trial: lacking minesweeper, they suffered, but with minesweeper... OMG... BombSquad has saved Apple! The tears flowed freely again, but this time tears of joy. "You saved them, John," mumbled my tablemate around his pie. "The journalists can have their 'halo effect' and 'virus proof' and 'post-split stock doubling', but I hope you can rest assured that BombSquad has truly made a difference for the platform you so dearly love." With that, he was gone, leaving me with warm pride in my heart and $4.99 less money in my wallet. until Apple is back on top again... atop a global audience of time-wasting geniuses, basking in the glow of their Cinema Displays, kept warm by the ferocious speed of their (Intel?) hardware! This marks BombSquad's version "4.0" and I'm celebrating... bugs have been squished, features added, and the fun is still there. Download and try it today!